Here is a beautiful Jenny Lind trunk from the Civil War period. Jenny Lind trunks are scarce. These were the top model trunks from any trunk maker of the day. They took quite a bit more work to put together and sold for a premium. Jenny Lind trunks were named after the Swedish singer who toured the U.S. in the early 1850's with P.T. Barnum. Known as the "Swedish Nightingale" she is said to have had a trunk like this one with her and they became all the rage for several years. They have a beautiful keyhole or figure eight shape. Most of the trunks like this were made in New England and are each a little different and hand made. This one has the original brass keyhole cover with working lock and we have included a working reproduction key. The four iron bands, large brass buttons, and iron hinges are all original with the exception of one. Only one of the original brass buttons was missing (which is rare), and some of the original brass buttons had the top wore off and had to have a little touch of paint, but I thought it was better to keep the original buttons on verses replacing them due to wear. The leather handles are new and the feet on the bottom of the trunk are reproduction brass buttons. The bottom is thick solid wood and in excellent and clean condition. The trunk is made of I believe pine with a tung oil finish. The interior is clean and has had the interior paper removed. There is a 1860's period lady's fashion print in the lid that is a reproduction and it really adds to the beauty of this trunk. The trunk measures 25.5" inches in length, by 15" inches wide at the base, by 14.5" tall . 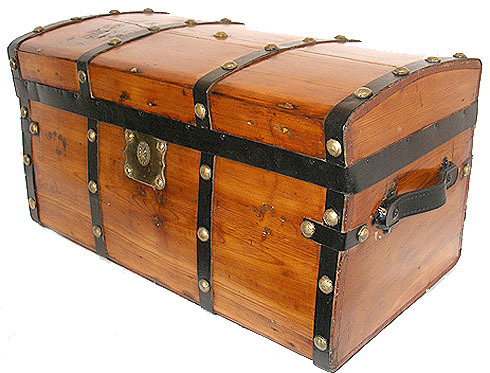 Quite an attractive and interesting trunk and ready to use anywhere in your home. A Very Rare Jenny Lind Trunk !